The Canes laced up their bright pink sneakers and tucked in their black-and-pink jerseys. The crowd buzzed. The Miami women’s basketball team was just minutes away from facing rival Florida State, but this particular Sunday afternoon was more than just a game. UM was taking part in its fourth Celebration of Women’s Athletics event, honoring student-athletes from each of Miami’s nine women’s programs and alumnae who helped pave the way for their success. Through the program, the Women’s Athletics Leadership Council will solicit donations, provide mentors for and grant scholarships to student-athletes. 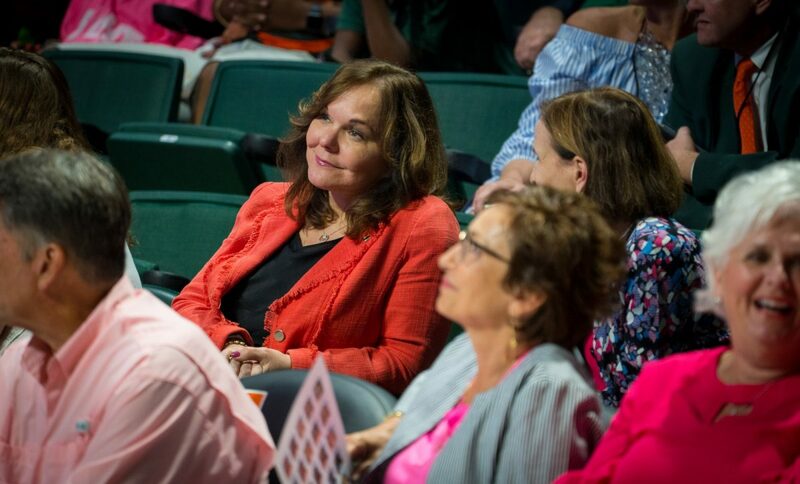 For many in attendance Feb. 11 at the Watsco Center, the initiative represented immense progress – not only at the university but in the world as well. The University of Miami has a historic legacy of supporting women in athletics. In 1973, UM offered the first ever Division I women’s athletic scholarship in the country to a tennis player. Miami has come a long way, but the journey isn’t over yet. Men’s sporting events typically have higher attendance than women’s, despite the same level of competition. Hilarie Bass, the newly appointed president of the American Bar Association and vice chair of the UM Board of Trustees, said the event wasn’t just about celebrating athletics but also about promoting the incredible athletes at UM. The Building Women Champions campaign aims to prepare student-athletes for life beyond UM and provide skills for continued success in the future. More than 94 percent of female executives have played sports, and half of them played at the college level, according to an email from Shalala and Bass. “You get enormous discipline and focus from sports, and those are two important characteristics for leaders,” Shalala said. UM women’s basketball coach Katie Meier has used her platform to support the growth of Miami’s players. Deputy Director of Athletics Jennifer Strawley said Meier is more than just a basketball coach, she is also a passionate leader who shows that sports can be used as a mechanism to educate. And for Shalala, her goals for Miami don’t stop there.